Star Surfers on the trails of Antoni Gaudí in Comillas, Spain! On the trails of Antoni Gaudí in Comillas, Spain! Last week, the Santander Star Surfers took our surf camp’s new beach cruisers out for a little spin around Oyambre Natural Park. Following the park’s beautiful coastal trails, we reached the Spanish town of Comillas within a few minutes. Besides pretty little cobbled streets, quaint houses, authentic shops, bars and restaurants, the village offers its visitors and surf holiday makers plenty of historical and cultural sights. With the town’s architecture being influenced by both historicism and early modernism, we got to explore the former pontifical university, the town centre’s a stunning chapel and one other very famous architectural building no one really expects to be here. Nestled between two beautiful parks and a little picnic area, our surf camp crew found Comillas’ “must see” hidden among hundreds of trees on a little hill: The villa, “El Capriccio”, designed by the famous Spanish Catalan architect, Antoni Gaudí. 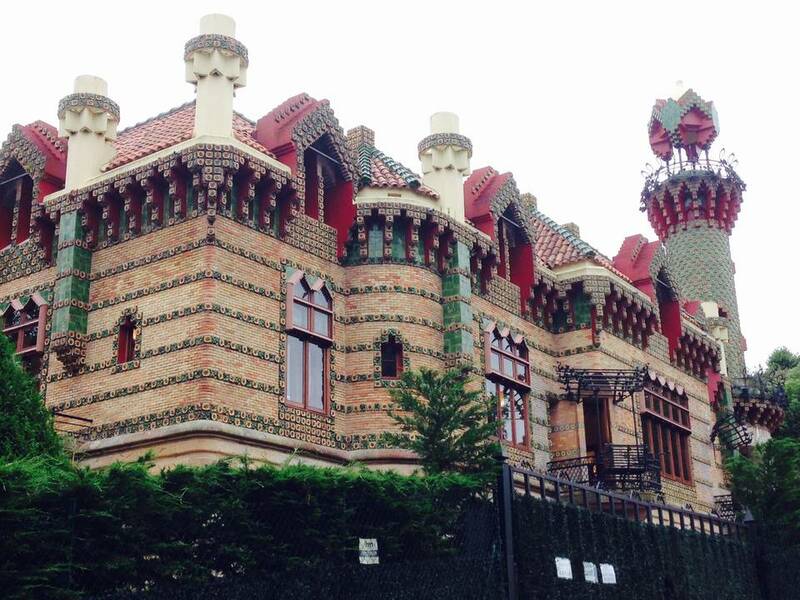 This architectural master piece is among Gaudí’s early works, then built for a private business man from Comillas. The building’s style has an unparalleled exotic and oriental touch to it which is visible in almost every brick. On top of that, a final, almost eccentric touch is added through the variety of materials and textures used: Glass-ceramics, wrought iron as well as mosaic and small sunflower tiles along all exterior walls together with a strategic use of space make for a building characteristic of Antoni Gaudí’s art! Inside, the rooms are arranged in a way they follow the solar cycle of a day, thus making the most of natural light. An interior conservatory literally floods the villa with light and creates a welcoming and warm atmosphere. After a tour around the villa and its different floors, our surf holiday crew went on to explore the grounds of this exciting place. After a coffee in the little Café, we still had time for a stroll through the horseshoe-shaped park with a bronze statue of the architect himself and the little souvenir photo. What makes “El Capriccio” in Comillas even more special is that Gaudí, as a famous Catalan architect who built impressive monuments, such as the Sagrada Familia or the Park Güell in Barcelona, only ever finished two monuments outside of Catalonia. That Comillas’ inhabitants are therefore particularly proud of their exceptional villa does not come as a surprise. Our Star Surf Camps Team as well as our Santander surf camp guests had a fantastic time exploring this little gem, and we’ll definitely be back to discover more of Northern Spain’s little secrets! And if you want to come along on our next treasure hunt, check out our Santander surf camp here. We look forward to surfing with YOU this summer!